What Happens After I Submit a Receipt to Checkout 51? Home » Checkout51 FAQ » What Happens After I Submit a Receipt to Checkout 51? 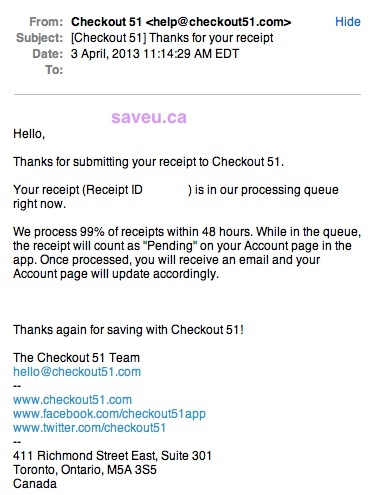 So you’ve shopped and purchased items off the Checkout 51 list, taken a picture of the receipt using the Checkout 51 app and submitted your receipt. Now what happens? Basically your receipt is sent to Checkout 51 for verification and your receipt is pending approval. They will take up 48 hours to approve / reject your receipt. You will get an email that they are currently reviewing your Checkout 51 receipt and you will also see a message in your Account Balance screen that you have a receipt pending. You can see the receipt pending approval in the Checkout 51 app. 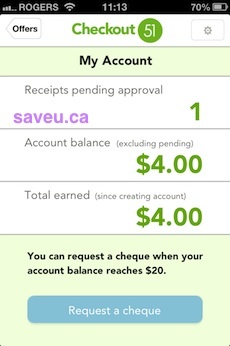 You can get to this screen by using the top left icon to see your Checkout 51 Account Balance. See my FAQ here on how to see your Checkout 51 Account Balance. How do I check my Checkout 51 Account Balance? Will my Account Balance Disappear After I log out of Checkout 51?